It’s the middle of August and that means new Kindles are just around the corner. There have been numerous reports online about what features and specs the new Kindle Fire HD tablets could have, but there’s been nary a whisper about what Amazon plans for the next generation Kindle Paperwhite. Don’t let the lack of rumors deter the idea of new Kindles, because there will most certainly be new models of E Ink Kindles this year like there is every year, (and Amazon cheated last year by essentially painting the basic Kindle black and calling it a new model, so we’re overdue for something new on that model especially). There’s speculation that Amazon could release a larger-screen Kindle Paperwhite ever since they killed the Kindle DX and then brought it back from the dead to start selling it again. The firmware on that device is so old and outdated (2010) that if Amazon wants to continue selling a larger E Ink Kindle there comes a point where they must update it to a new model. That’s the first thing I’d like to see with the next generation of Kindle Paperwhites, a larger 9.7″ model as an option. The newer Kindles have much better PDF support than the Kindle DX ever did. Improve PDF support a little more and 9.7″ Kindle Paperwhite could be very popular in that regard. Plus a lot of people prefer a larger device for reading ebooks, especially people with vision problems. The second thing I’d like to see Amazon add to the Kindle Paperwhite is audio support. That used to be a standard on all Kindles, but Amazon did away with it entirely on the Kindle Paperwhite. Bring back text-to-speech, MP3 support, and audiobooks would make a lot of folks happy. Of course Amazon would need to add more internal memory as well because audiobook files are quite large, and there’s about zero chance they’d add a memory card slot. Another thing I’d like to see on the new Kindle Paperwhite is physical page turn buttons along the sides. Ever since Amazon introduced touchscreen Kindles they’ve done away with any sort of page-turn buttons. Touchscreens are nice for interacting with a device, but sometimes nothing can beat a nice tactile button to rest your thumb on to turn pages with a simple press instead of having to reach for the screen to swipe every time. It would also be nice to have the option in settings to turn off the touchscreen when needed. The last and most important thing I’d like to see with the new generation of Kindle Paperwhites is better frontlighting. The #1 complaint with the 1st gen Kindle Paperwhite is the unevenness of the lighting on the screen and the distracting discolored blotches that appear on some units. Amazon needs to improve on that to catch up with Kobo, whose frontlit ereaders are superior in terms of even light distribution and coloration. I don’t see Amazon improving on the resolution this year given E Ink’s available screens, except for maybe a larger Kindle, but if they could make the lighting better it could help a lot in terms of readability. So what you? 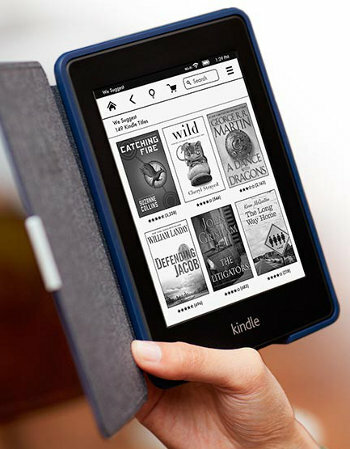 What features and improvements would you like to see on the next generation Kindle Paperwhite? I would like a 5”with front light and physical bottoms. I would be happy with just a front lighting update. My suspicion is that might be all we receive, so I hope its impressive. Perhaps an updated firmware with font improvements and even more visual control would be also be nice. I’d like to see a sensible folder/subfolder filing system (please?) so that we can really store all our books on the thing and dispense with “collections”, “shelves”, tags and so on. Why not simply recognize shortcuts if you want to file a book under several different categories? Reviews rarely mention the filing system and storage/retrieval as though it doesn’t matter. If we aren’t to store plenty of books why do the reviewers go on about extension cards? At present one has to rely on Calibre to allowing us to make folder-like structures so we can actually FIND books without impossible tedium. I’d also like a different, customizable interface. I’d like to be able to have a choice about no icons, or fewer icons because I can read, so I’d prefer more info on a page rather than always having large icons and pics to be poked at. Good luck with that folder/sub folder request. Tons of people have been asking for that since the original Kindle came out. Collections are better then nothing, but nothing beats just dumping your folders where you want them. I don’t know about a 9.7″ But after I got my hands on the Galaxy Note 8.0, I’d love a 8″ Reader. Count me in with the 1st and the 3rd wish! What I’d really like to see are some software improvements. Better organization options for books, better book navigation, more search options etc., those 3 alone would make my kindle experience so much better. Hardware-wise I just want more even lighting and maybe make the device weigh a bit lighter. I prefer a minimum of 8” screen which i feel makes reading ebooks better. I’ve been following this blog for over a year now, and I simply love it. Keep up the good job! 1) support of epub format: this is a dealbreaker for me, I have no desire to convert epubs to mobi every time I load them in the device. Sadly I dont see this happening in the foreseeable future. 2) tighter integration with Goodreads: now that Amazon has bought Goodreads I think it is likely to happen. By integration I mean: progress sync, books added automatically to the Currently Reading-shelf and to the Read-shelf once finished, possibility of rating a book from the device, etc. Physical page-turn buttons. My mom has been clamoring for months that she wants her own Kindle, and she’s been borrowing my Paperwhite. Although she could navigate pages just fine in the past, the last time was a total nightmare. She had no idea what she was doing, no matter how often I literally spelled out every single step. Now she hates it, and she refuses to accept a refurbished original Kindle. It has to be new or nothing for her. I’m new to the Kindle world from the Nook Glow world. I just bought a PW yesterday and am impressed by Amazon’s support, the nice build quality of the Kindle, and the display (much whiter than Nook Glow). The Amazon thin case is awesome, btw…well worth the $39 price. I’d like to see official support for user-customized screensavers built in (without having to hack it), as well as epub support. DRM gets tricky, but it would be great to be able to “Send to Kindle” a DRM-free epub and have it be converted online to mobi format. By the way, I do like the “Send to Kindle” feature and the fact that Amazon continues to support their e-ink readers with updates. That’s a good point. I think Amazon should add DRM-free ePub’s to the list of formats that can be easily converted to Mobi using email or the “Send to Kindle” feature too. I hadn’t thought about that before. I know it’s a long-shot that Amazon would ever officially support ePub format, but they really should consider at least adding it to the list of supported formats for conversion. 3) Storage capacity options. I have a paperwhite that can not hold my entire kindle library. This means that I can not search through all of my items; I can search through all of my items ona kindle touch. I have about 1200 books and the paperwhite does not have the capacity to hold everything on the device. I am willing to pay for a great reading experience. 1. The choice of either showing collections or books in your library, but not having to have both as it is now. 3. Ability to move your books around in your library as you see fit, not by author, title or recent. Example – you want to shelve all your collections together by subject and see the covers all together, mixed in with all the other subjects. Or, by order you feel like reading them. Or..anything. I don’t how others missed this issue. The current minimum brightness level on paper white is still bright for a complete dark room. It’s still disturbing people sleeping in the same bed room. The minimum should be dimmer than what it is now. The number one thing I wanted was physical page turn buttons. I like holding my device in one hand and just clicking to turn the page. I will not be upgrading to a newer model unless they have one with a light and physical page turn buttons. I would greatly appreciate a larger 8-10″ Kindle. Since I have trouble with my vision, I have the font set up higher than normal so I only get a few lines before having to turn the page. A button page turner would be great, also. For my bedtime reading habit of holding my paperwhite in one hand, let me program which side the ‘next page’ tap area is. If i’m on my left side, next page should be on the left, and vice-versa. Hey, reading in bed should be convenient! One thing about Amazon I’ve learned is they don’t like giving users many options for software customization at all, which is the most frustrating thing about the Kindle line. But one good thing about the Paperwhite is it is programmed to recognize swipes as page-forward from the left side of the screen. Instead of using a tap, drag your left thumb slightly from right to left and it will page forward instead of backward.